There is almost nothing more fun than poking through an old cookbook. And this old cookbook, published in 1966, is a doozy. 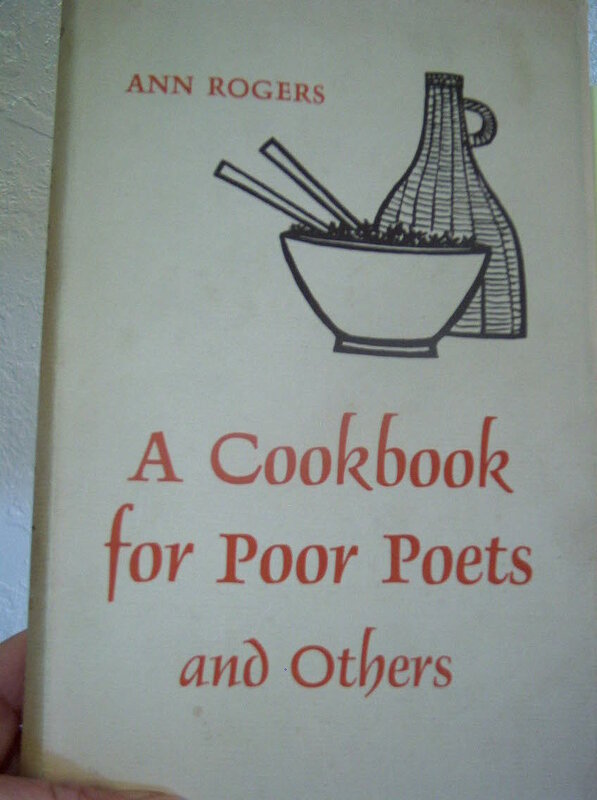 I'm pretty sure I bought it at a library book sale, and have tried maybe half a dozen recipes from it over the years. The recipes are excellent -- easy to make, different, and, as you might guess from the title, economical. And the text is grand fun to read. This is from the foreword, by Louise Bogan: "Poets are often out of funds. Many times they try to keep body and soul together by eating candy bars, apples, doughnuts, and an occasional hamburger, usually standing up. This is a mistake. Meals should be eaten sitting down." The dish I made tonight, called simply "Conde," starts with sauteed pieces of bacon and sliced green onions. Add to it a can of kidney beans and a couple of other ingredients, and you've got an inexpensive dish that you can serve with a salad, some fruit, a roll perhaps, and call it dinner. Brown the bacon and onions in large skillet. Add rest of the ingredients except for the file powder and cook over low heat for 15 minutes. Stir in the file powder and serve. Do you have a favorite "nickel dinner," as author Ann Rogers puts it? So- is this a soup? It looks like a yummy soup. My favorite "nickel diinner" Is hamburger bean casserole. 1# hamburger + half a chopped onion - brown together (you can add half a chopped green pepper, too, but my kids don't like gr. pepper). The original recipe says to put in a 8x8 pyrex and bake at 350 for 20 minutes. I can't be bothered with such nonsense and I let it simmer on the stove until we're ready to eat. It feeds my family of 5 for about $6! this looks so yummy, what a fun book! I love reading old cookbooks...I think they tell so much about culture at the time. This recipe looks like a real keeper! Oh, I love the old cookbooks, too and I'm always on the look-out for one at thrift stores and yard sales. 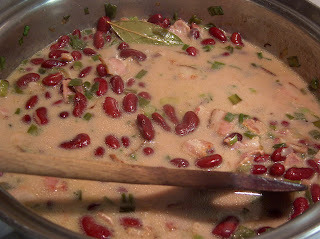 Just about any kind of bean dish can be inexpensive if you don't add the pricier ingredients to them. I have a Tuscan White Bean Soup that I make: onions, white beans, garlic, chicken broth, salt, and rosemary. 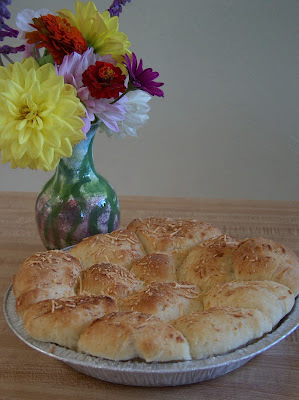 It is so good with homemade bread. Thanks for sharing this recipe with us. I'll have to try it! looks like you have some great recipe's! thanks for the comment on my blog! Love that cookbook! It is just the type of book that I woud get. Very retro. Love that recipe too. Did you feel like a poet eating it? I wish some of them would have come my way! That's like the perfect dinner. And I've been looking for something like this! Still cackling over the quote from your book. Beans and bacon are always good. Nickel dinner? In the old days it was a can of chili over cooked rice. Or sometimes just "dirty rice", you know cooked hamburg with rice. Whatever it was, rice was typically involved, smiles. Oh my gosh, I just read through your profile, I have your book!!!! I have been doing it weekly this year, How funny is that. I love it too. You have made me laugh at myself. It sits on my nightstand and each Monday I read though a chapter. Thanks for stopping by and for all the things your wrote about. Thanks, Karenpie and DarcyLee and Katy for the nickel dinner suggestions. You can never have too many frugal recipes on hand. Louise, Ally, Faith, I think you may have to keep your eyes wide open for an opportunity to get this cookbook. It's a real winner, in my opinion. 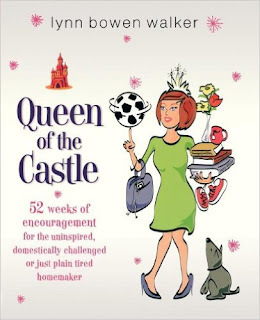 Farm Girl, how fun is that, that you're reading through Queen of the Castle! Very cool. Thanks for sharing that. You made my day. I have this cookbook!! I got it for Christmas from my daughter. Did you see the cookie recipe that takes 2 years to make?? You make a dough, let it sit a year, make the cookies and let them sit a year and then eat them. I thought I'd like to try them. I wish I remembered the name, maybe German or Dutch. Kinda cool. Dicity, cookies that take two years to make -- that is too funny! I just looked through my book and found the recipe. The cookies are called Leckerlein, and the instructions are on pg. 154-155. You will have to let me know how they turn out! And you are more patient than I. The longest I've waited for a recipe to be "done" is a few months, which is how long it takes for the plum liqueur I make with our backyard plums to develop. Have you made anything else from the book? I like the omelet on pg. 9-10, the veggies on pg. 24, and the Peasant Potatoes on pg. 78.